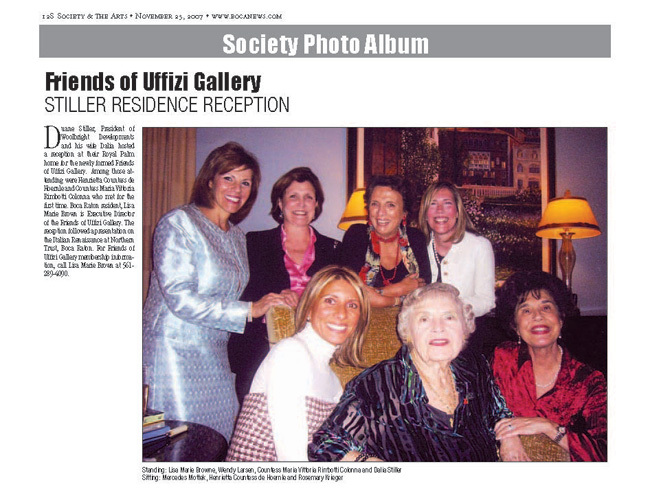 Over 200 guests attended Art and Passion, the private 2007 Northern Trust Boca Raton event and presentation on the Italian Renaissance hosted by the Friends of the Uffizi Gallery and Liska Langston of Northern Trust Bank. The event featured honored guests from Florence, Italy including speakers Dr. Antonio Natali, Director of the Uffizi Gallery and Contessa Maria Vittoria Colonna Rimbotti, President of the Friends of the Uffizi Gallery. Dr. Manuel Guerra, Vice President of the Friends of the Uffizi Gallery and Dr. Patrizia Asproni were also in attendance. Following the lecture and reception, guests enjoyed a private dinner at the home of philanthropists Duane and Dalia Stiller.